Back in 1993, it was still possible to wring every last possible single out of a smash album, whereas these days the best way to have a hit-laden album is to do a Calvin Harris or Jonas Blue and put the album out after you've already released half a dozen or more successful songs. This week in 1993, two singles from albums that had many tracks lifted from them entered the ARIA top 50 by artists who were used to their albums having a shelf life of a couple of years while they picked song after song from them. Another performer whose previous album contained a stack of chart hits found himself at number 1 this week in 1993. Bryan Adams knocked Ace Of Base off the top spot with "Please Forgive Me". Having exhausted Funky Divas of singles, the girl group released EP Runaway Love and this unremarkable title track. A much bigger hit from the EP, a collaboration with Salt 'n' Pepa, would follow. Had the reggae bubble burst? This cover of the Fats Domino song was massive in the UK and New Zealand, but did next to nothing in Australia for Delroy McLean. Her previous studio album had yielded her biggest hit ever, but this cover of a Billy Bragg album track from 1988, which would eventually appear on 1995's Salvation Jane, wasn't the best start to Jenny Morris's new deal with rooArt. Here's another New Zealander who now called Australia home finding it tough going on the ARIA chart, with this second single from Are U Satisfied missing the top 50. 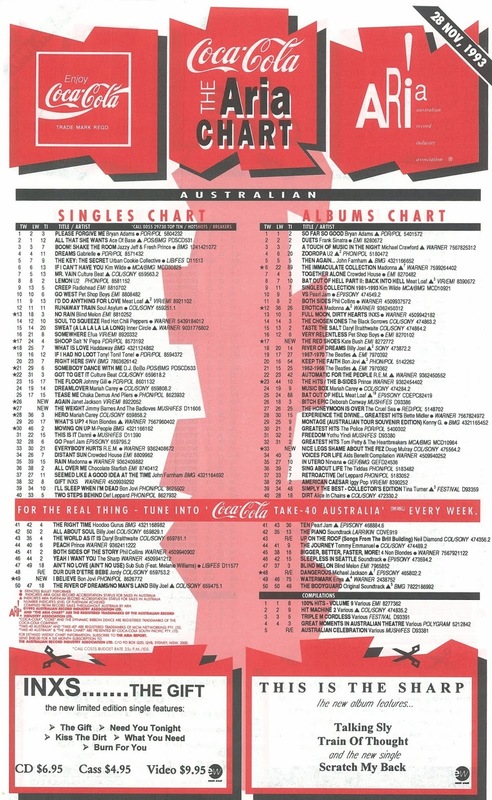 Slippery When Wet had provided four singles; follow-up New Jersey had offered up five - and so it was only logical that Keep The Faith would deliver six singles for Bon Jovi fans, who duly made all six of them top 40 hits in Australia. "I Believe" was the fifth (and least successful) of those singles, and as I write this I have absolutely no idea how it goes. Having now clicked play on the YouTube link below, the song is in no way familiar, while I could definitely sing you the chorus of the album's previous four singles if I had to. It's understandable why this didn't do any better. Still, a top 40 hit is a top 40 hit and this became Bon Jovi's 13th - a string only blighted by 1989's "Living In Sin". Next up, a singer who was used to landing a decent amount of hits from his usually chart-topping albums - but in 1993, Jimmy Barnes' track record hit a major stumbling block when two of the four singles taken from Heat missed the top 40. Moving swiftly along, Jimmy released a second album in 1993, timed nicely for the Christmas market. His take on an MTV Unplugged-style release, Flesh And Wood saw Jimmy in acoustic mode - a sharp contrast to the loud rock of Heat. And taking no chances, he released a remake as its first single. Aided by The Badloves, Jimmy covered "The Weight" by The Band and was duly returned to the top 10. 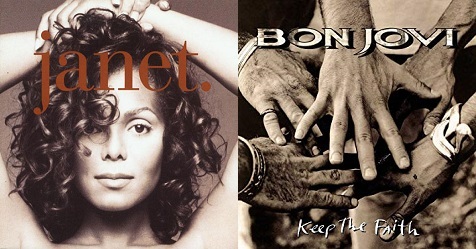 Janet Jackson did not mess around when it came to milking her albums of singles. Seven were lifted from Control (an album with only nine tracks) and eight had been taken from Rhythm Nation 1814. Although sweet ballad "Again", which had previously appeared on the soundtrack to Janet's feature film debut, Poetic Justice, was only the third single released from janet, it was safe to assume it wouldn't be the last. Far from it. 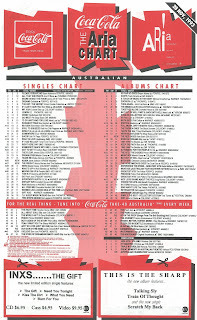 As a bonus, by reaching number 19, "Again" marked the first time Janet scored three straight top 20 hits in Australia - a sure sign that subsequent singles from janet would reach a more receptive audience locally than many of the tracks taken from her previous two albums had. Next week: the latest single from another album that had already been mined for a stack of hits. Plus, the chart return of a decade-old song. I never understood why artists like Janet and Michael Jackson could release 90% of the tracks on their albums and they would all chart (or at least most of them). I mean, wouldn't everyone who didn't hate them have their album by now? But people were still spending $5-$8 on a cassingle or CD single, so was it because they couldn't afford the $28-$30 for the album? It was only the very occasional single that had a remix that was good enough to compete with the original, so I doubt they were shelling out, in this instance for example, for some DJ's bizarre B-side ten-minute take on "Again". Again never had a 10 minute remix, only a "piano" version and a French version not released locally, so not sure what you are thinking of there Al! Janet and Michael's singles usually included either multiple remixes or prior hits to offer an incentive to buy them. Plus they are both very collectible artists (as are/were Bon Jovi, Metallica, Madonna, Prince and Kylie for that matter), so it's only good business to keep releasing single after single if people keep buying them. Never knew that 'Whatta Man' first appeared on the 'Runaway Love' EP (which, until now, I didn't know was an EP). I wouldn't have heard the Bitty McLean track at the time if not for buying a UK 'The Greatest Hits of 1993' 2-CD compilation in Hong Kong at the end of the year. I had to laugh when I saw the artwork of a McDonalds 'Hot Hits Vol. 1' cassette (available for $4.95 or thereabouts) behind the 'Reflections' video. Skipping a few weeks ahead on the printed charts a few weeks ago, I had no recollection whatsoever of the Bon Jovi track. It becomes vaguely familiar once the chorus comes in. It would surely make the perfect answer for a 'pointless' Bon Jovi top 40 'hit' on the game show of the same name. One interesting tidbit of information I recall about 'The Weight': the chorus lyric is "take a load off, Annie", but Jimmy Barnes thought it was "Fanny" and sang it as such. LOL. I want to like 'Again'. The piano bits are nice. But... her voice sounds like Big Bird's when she starts singing. Sorry (not sorry).